Minnows' World Cup? Not quite yet - OFFSIDE ! 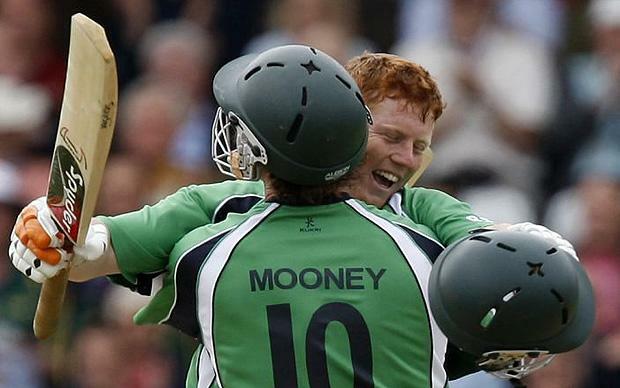 The Irish team defeating the Englishmen has been dubbed as one of the biggest upsets in the cricketing history, akin to Greece taking the Euro Cup football in 2004 or Boris Becker winning the Wimbledon in 1985, when he was just 17. True, it was one of the biggest shocks in World Cup history. This can also be assumed by the fact that, the bookmakers were ready to offer mere 400-1 odds for the relative minnows, trying their fate with the English team that had tied a match only a few days ago, against the mighty Indian team, at 338 runs. The Ireland team chasing down the biggest target in Cricket World Cup history, at 328, is also a thumping challenge to the ICC executive board, which approved that 2015 CWC will consist of only 10 permanent members and associate members cannot participate in the tournament. Then, the decision had drawn flak from associate members and we’d started questioning if the acronym ICC actually stood for International Commerce Council and if the term ‘development’ did not actually feature in ICC dictionary. But then, we associates hardly have a loud voice. At the time the world bodies of sport are lost in the cacophony of ringing at the cash counter collections, we, the associate members are regarded as the recipients, getting donations from them – the cost centers and not profit centers. But now, the Irish cricket team, led by one of the best ODI innings ever from Kevin O’Brien, has given a thunder in our voice. The defeat of English team at the hands of Ireland is similar to Mike Tyson being defeated by little known James Buster Douglas in 1990. Never had a boxing ring heard such a loud thud, when Douglas knocked out the then undisputed world champion, Tyson in Tokyo. The thud, to many, is still deafening. It was a thud of minnows arriving. It was a thud of a new world order coming. The Irish team has created a similar thud. And the noise should be heard by those who sit in the executive board meeting of ICC. For, we, the associate members of ICC popularize the sport, make it reach millions more than it already has. We make it an international sport and not a game played just by former British Colonies. We wish just that a few more minnows should replicate what Irish team has done. We need more O’Briens, more Douglas and there would be a day when we would see Paras Khadkas, Gyanendra Mallas and Binod Dases playing at the world stage. We hope ICC has ears and can hear. Because, another song from the great man says: Please get out of the new one, if you can’t lend your hand… For the times they are a-changin’.